Today’s topic is about vintage 1950s attitude regarding nuclear power. 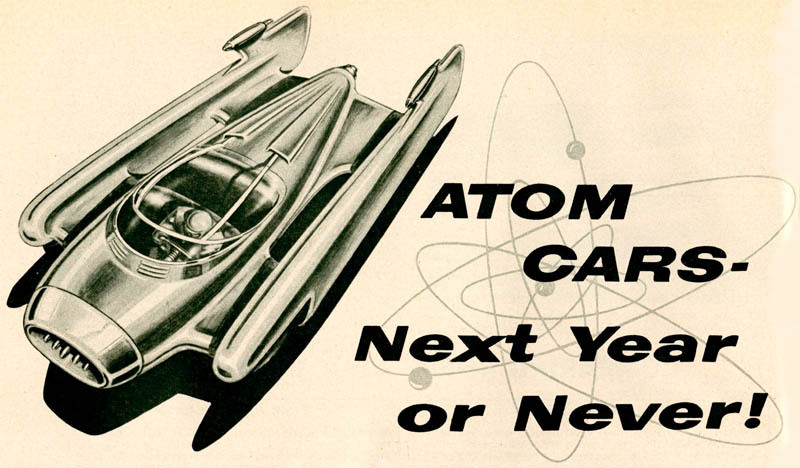 The country loved the atom back then and designers tried to incorporate nuclear energy into everything. Fans of the old, but still wonderful, Road Runner cartoons might remember Wile E. Coyote's favorite one-stop-shop for mayhem: The Acme Company. A clever person once said that Acme's slogan should be "We Add Rockets To Everything." This, in a kind of round-about way, gets us to the 1950s and the near-obsession that certain engineers had back then with a certain power source. To put it another way, their slogan should have been: "We Add Nuclear Power To Everything." In all fairness, at first we t hought that reactors have proven – for the most part – to be pretty reliable (we are now re-evaluating this again, in view of recent Japanese disaster). Submarines, commercial power plants, and even monstrous icebreakers have proven that nuclear power can be handy if not essential. But back just a few decades ago there were plans, and even a few terrifying prototypes, that would have made the Coyote green with envy – and the rest of us shudder in terror. Both the US and the Soviet Union had engineers with lofty plans to keep bombers in the air indefinitely by using nuclear power.